• Annual cost savings of circa £250k through removal of data rekeying, optimal operational processes, reduced solutions maintenance. • Significant risk reduction arising from an improved control environment (e.g. Solvency II, Security, Lloyd’s standards) – financial penalties for failure for which could be significant. • Cost avoidance (£5m+) of a full system replacement though leveraging investment in previous UW platform. 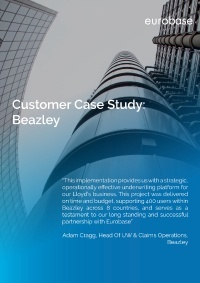 • Significantly improved security for sensitive risk documentation, providing significant mitigation against a £5m-£20m data breach risk event that would otherwise have cost in excess of £250k to fix with previous technology.